The 1960s provided football with its first truly global superstars. Pele, Eusebio, Facchetti and Charlton all reached their peaks in those ten years, following on from the previous decade from which the game was revolutionised by Gustav Sebes' Hungary and the European Cup. The 1970s would continue the global enhancement of the sport, with the colour television becoming more and more prevalent and the popularity of football hitting even greater heights. However, from within Britain and abroad a new fear would begin to grip numerous sporting occasions - hooliganism. Aside from the depths of domestic unrest, the decade would still fashion the greatest players, managers and arguably the best club and international sides to ever grace the beautiful game. 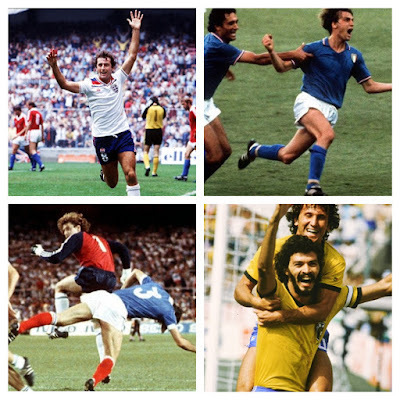 Most of the "Football By Decade" series has taken a familiar structure - First we look at England, then Wales, Spain, Germany and Italy, with a closer look at international football also thrown into the mix. However, as the 1970s developed, football was being played at a top level in far more than just four or five countries. Nevertheless, the focus of this piece will still be centered on the same nations, albeit with a few extra stories from around the footballing globe. The 1970s was a defining decade for English football, following Manchester United's European Success in 1968, the Football League began to see an opportunity to dominate on a continental scale. After all as of the 1st January 1970, England were also World champions following their 4-2 victory at Wembley over West Germany in 1966. Domestically and further afield it was to be ten years of intriguing viewing for British fans, highlighted somewhat by the rising TV audiences. It was Arsenal who became perhaps the first dominant side in England winning a League and FA Cup double in 1971 - albeit completing the honour ten years after bitter rivals Tottenham Hotspur. Charlie George was the Gunners' hero scoring the winner against Liverpool with just nine extra-time minutes remaining. Despite defeat in 1971 it was The Reds who go on to form what FourFourTwo have described as the "First genuines British footballing dynasty" throughout the decade under Bill Shankly and later Bob Paisley. One of +The Football History Boys' earliest pieces was asking the question whether that they were in fact one of the greatest teams ever? Few would disagree. Players such as Ray Clemence, Kenny Dalglish, Kevin Keegan all featured for Liverpool between 1970-79 as the club won a total of four First Divisions, two European Cups, two UEFA Cups and an FA Cup in 1974. This for many was impressive and difficult to emulate, only for the 1980s to be even more successful for the Merseysiders. "The eternal city played homage last night to the everlasting footballers of Liverpool....Kevin Keegan and Tommy Smith are the new names in the legend of the European Cup. And those English names may perhaps trumpet the beginning of and end to the depression which has blighted our football...On a suffocating night England's champion team scaled new heights of triumph and endeavour." Liverpool and Bob Paisley's dominance would seems almost impossible to compete with, but this is simply not entirely the case. Bill Shankly is often regarded as one of football's great orators, but a certain Brian Clough would have a lot to say on the matter. The 1970s were as much about Clough as anyone else. The 2009 film "The Damned United" goes some way in putting a quite incredible story into 98 minutes. Clough's managerial career spanned twenty-eight years, but it is the 1970s when he was at his greatest. Managing Derby, Leeds (for 44 days) and Nottingham Forest he would win two leagues, two league cups and the European Cup, one year after Liverpool - promoting a continental dominance from British Clubs. Rivalries like that between Clough and Don Revie were born, making for compelling viewing and drama which other league failed to match. It feels almost wrong to put such an incredible man's career into one paragraph, surely providing fuel for later pieces from TFHB. There were however, two sides to British football in the decade, for the triumphs of Liverpool, Arsenal and Forest there was also domestic social unrest throughout the country. From the levels of rising unemployment, and failing consensus government came hooliganism, a plague which would effect the sport for the next twenty years, before action was finally taken in 1989 following the Hillsborough disaster which the police and government were to cover up for next twenty-three years. Again such matters are best suited to a separate blog, but it is worth mentioning to highlight the darker side of football. Notorious "firms" like the Chelsea Headhunters, The Inter City Firm (West Ham) and The Herd (Arsenal) began to emerge and numerous incidents of opposition supporters clashing made the headlines for all the wrong reasons. The problem of hooliganism at and after football matches has now reached crisis level...football is a form of tribal warfare. The rosettes are the badges of the armies, the stadiums and streets are battle grounds and the incidents of the match itself are rallying cries for invasion of territory on the terraces." As far as the Welsh Football League teams, Cardiff and Swansea, the decade was once again one of mixed fortunes. At the start of the ten year period, the capital city side was still in Division Two, with Swansea a league below. Cardiff narrowly missed out on promotion to the top flight in 1971 by three points from Sheffield United, but a Welsh Cup win meant qualification for the Cup Winners' Cup. The Bluedbirds were to lose on penalties to East German club Dynamo Berlin at Ninian Park. The next three seasons saw Jimmy Scoular's men flirt with relegation before succumbing to the drop in 1975, despite further Welsh Cup wins in 1973 and 1974. For Swansea it was a decade of desperation following two relegations and only staying in the Football League due to re-election in 1975. Cardiff achieved promotion in 1976 and Swansea's fortunes were also set to change for better - significantly fueled by the outstanding signing of Liverpool and former Cardiff centre-forward John Toshack as player manager. "Tosh" steered the Swans to a second successive promotion in 1979 leading to a English Second Division with three Welsh sides involved! 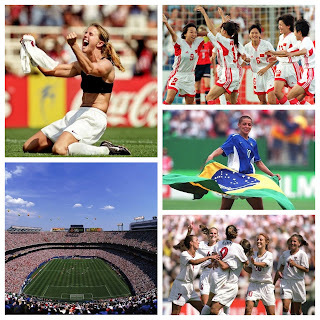 "Based on numbers alone the women's game seems to have progressed rapidly during the 1970s. By 1979 as many as 300 clubs were affiliated to the WFA, involving an estimated 6,000 players and 21 regional leagues...Despite these advances, female participation remained constrained by a host of administrative, ideological and legal barriers. 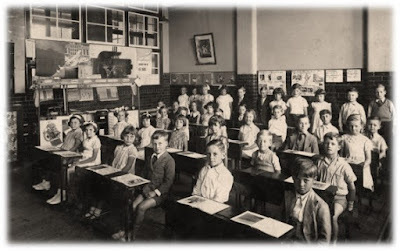 Although the FA agreed in 1971 to rescind the 1921 ban, there was little in the way of financial or administrative assistance until 1984." So what of the rest of Europe, we already by now know that football sides were found to be playing at a higher class by the 1950s, following decades of being in the Football League's shadow. In Spain the 1970s were another decade of change, albeit this time for the better. The La Liga title switched hands between Valencia, Atletico, Real and Barcelona, before the latter Madrid began to assert some kind of dominance on Spanish football winning five leagues between 1973-79. Football on the Iberian peninsula was not far from the big names of the game. The likes of Johan Cruyff, Johan Neeskens (Barcelona), Mario Kempes (Valencia) and Paul Breitner (Real Madrid) made for, quite simply, a global league of superstars. Finally a note on the Copa Del Generalissimo, which had become the Copa Del Rey's name under the fascist dictatorship of Franco, between 1936-1975. By his death, Juan Carlos I had succeeded as the new ruler of the nation, before begin the process of devolution, and re-establishing democracy in 1978. The cup also took its old name and institutions like FC Barcelona began to receive relative freedom after decades of repression. It would be criminal to analyse the 1970s without discussing arguably the greatest ever club side to grace the game: Ajax (1965-73). +FourFourTwo regard the side led by "coach of the century" Rinus Michels as the "James Bond" of football, and liken the stylish 'total football' adopted by messrs Cruyff, Neeskens, Haan and Krol to that of "artists, writers, even ballerinas". 6 Eredivises, 3 consecutive European Cups and multiple domestic honours in the Netherlands instilled an aura of invincibility to the Amsterdam club. Teams like that of Liverpool, Milan, Real and Bayern have become known as greats, but surely no one ruled in a manner so stylish, graceful, yet destructive as Ajax. "Among them was Ajax, a football team that if not the greatest there has ever been, was almost certainly the most influential. Speak to Arsène Wenger or Arrigo Sacchi, Marcelo Bielsa or Pep Guardiola, and all, to an extent, have drawn their philosophies from the team created by Rinus Michels. German football also saw a renaissance of sorts between 1970-79. Of course, internationally the country - at least the West - had triumphed in 1954 over the Magical Magyars and lost to England in 1966, leading to them being regarded as one of the best nations on planet football. At club level it was different, not until Bayern Munich's team of Beckenbauer, Muller and Maier ruthlessly toppled the genius of Ajax, winning three consecutive European Cups (1974-6), did they really rule Europe. Domestically Borussia Monchengladbach dominated the second half of the decade and were almost European champions but for the aforementioned defeat to Liverpool in 1977. A World Cup win in 1974 over the total football of Rinus Michel's Holland meant that Germany was now the footballing nation of the world. Finally a look into the Italian game - where surprise, surprise, Juventus led the way. Dino Zoff, Claudio Gentile and Marco Tardelli were just a trio of names to represent the Old Lady during the decade. Domestically northern clubs Inter, Milan, Torino and Juve led the charge with a first Serie A title going to Lazio in 1974 briefly stopping the Northern juggernaut. However, in terms of major European triumph, the nation actually suffered. The 1970s was a baron ten years in terms of success on the continent with Inter and Juve only managing runners-up medals in 1972 and 1973 respectively. A UEFA Cup win for Juventus in 1977 recovered some respectability but there was a general sense of something greater growing, the nurturing of youth meant the 1980s could prove highly successful of the Azzurri nation. 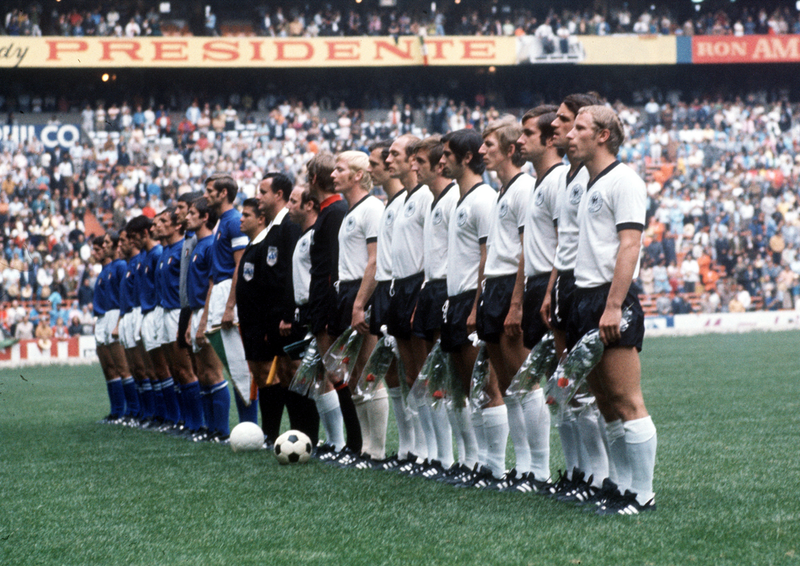 Italy themselves had memorably reached the final of the 1970 World Cup, playing out the "Game of the Century" against top scorer Gerd Muller's West Germany in the semi-final. The match just simply has to be our "Match of the Decade". The heroics of Luigi Riva, Gianni Rivera and Giacinto Facchetti are still fondly remembered on the Italian Peninsula. The 4-3 extra-time victory is so commemorated - it even has a plaque outside Mexico's Azteca! 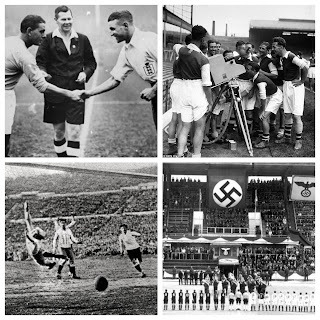 It surely runs Hungary 6-3 England close to be regarded as the greatest match of all-time, an encounter which saw five goals scored in extra-time after finishing 1-1 in normal time, thanks to a 90th minute equalizer from German left-back Karl-Heinz Schnellinger. Tarcisio Burgnich, Gerd Muller and Luigi Riva traded goals in the resulting thirty minutes before Gianni Rivera finished the Germans off with nine minutes remaining! Jeff Powell, 'Kings of Europe! ', Daily Mail (London, England), Thursday, May 26, 1977; Issue 25186. Brian James, Daily Mail (London, England), Monday, September 01, 1975; pg. 26-27; Issue 24651. Uli Hesse, Martin Mazue, Mick Moore, Andrew Murray, Mauricio Savarese, Paul Simpson, 'The Greatest Club Sides of All Time', FourFourTwo, (Haymarket, 2013) Issue 232.